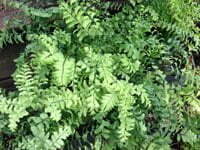 Hardy ferns add a lacy look to your garden. I love hardy ferns because there are so many native options. Growing and spreading quite happily in woodlands and near streams, ferns are a low-maintenance addition to your shady garden. Hardy fern varieties range from 1’ to 6’ tall, so there’s a fern that’s just right for every spot! They also tend to be more deer-resistant than hostas, while providing a gorgeous delicate texture with an arching, elegant look. Light: Full to part shade, with protection from afternoon sun. Water: At least 1” of water per week with mulch to keep the soil evenly moist. Soil: Rich, humusy soil, similar to a forest floor, with lots of organic matter and compost. Most ferns prefer somewhat acidic soil. Division: Divide clumps in fall or early spring. Size: Range from 1’ to 6’ high. Some ferns spread through runners, more like a groundcover, while others grow in tidy clumps. Make sure to choose a fern that fits your design. Climate: Cold hardiness of hardy ferns varies depending on the type. Fertilizer: Feed in the spring with a balanced, organic slow-release fertilizer. Don’t over fertilize.